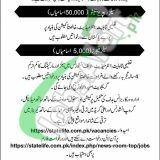 For all the applicants here a recent job is there from State Life Insurance Corporation of Pakistan Jobs 2019 Latest Advertisement. Applications are being invited from the State Life Insurance Corporation of Pakistan is looking to talented, calibre and well-disciplined applicants are required on regular basis to fill the following posts. Jobs in State Life Insurance 2019 which are named as (Sales Representatives (50,000 Positions) and Sales Managers (5,000 Positions)) are the posts which need to be filled as soon as possible. All positions are going to recruit on merit basis and these positions are based at different cities of Pakistan. Now, I will let you know about its further details below. State Life Insurance is the well known company of Pakistan is federally known and is responsible for the insurance deals and all sort of such works and its zonal offices are lying in every part of our country. Being a Govt department it offers Govt jobs of all levels. Age limit should be maximum 25-35 years. Applicants may apply online at www.statelife.com.pk. Application Form to apply for both positions is available at www.statelife.com.pk or www.JobsAlert.pk. Interested applicants are required to apply by submitting an application form along with detailed CV to the nearest Zonal/Sector Offices. The last date for submission of application is May 06, 2019. Last Date to Apply: May 06, 2019.